The css style and much of the layout of this site was stolen wholesale from http://www.freecsstemplates.org/. Laziness won out, I didn’t feel like designing the site from the ground up at the time, and these files, written using SHTML server-side includes, provided an easy spring-board. Now, as I try to expand the site several months later, I find myself locked into a format for which I had not thought out all of the ramifications. So first, a word about the site implementation: SHTML provides an exceedingly simple server-side scripting language on top of HTML. Essentially, it gives you server-side includes (the ability to insert code from a different file before serving content to the user, which I use to display the same side-bar, footer, etc… on all of this site’s pages), simple loops and control directives, and not much else. This is brilliant if you’re interested in maintaining a site with shared content across a simple structure. and voila, the site would be ready to use wordpress. But, I’m ornery, and I don’t like change, and more importantly, I wanted to understand if the two languages could be made to run side by side. Short answer: no, they can’t. The processors which parse the SHTML or PHP code and generate HTML to push to the client are chosen based on the filename, and you cannot modify the server behavior to run these processors serially. Conclusion: it would have been faster to migrate to php, but now I know a bit more about the technology serving this site. Active laziness wins again. 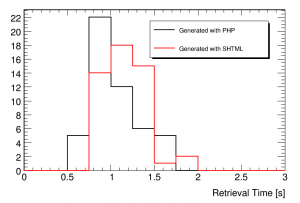 I said that the performance of pages served using PHP and SHTML were essentially the same. This is perhaps not quite so true. 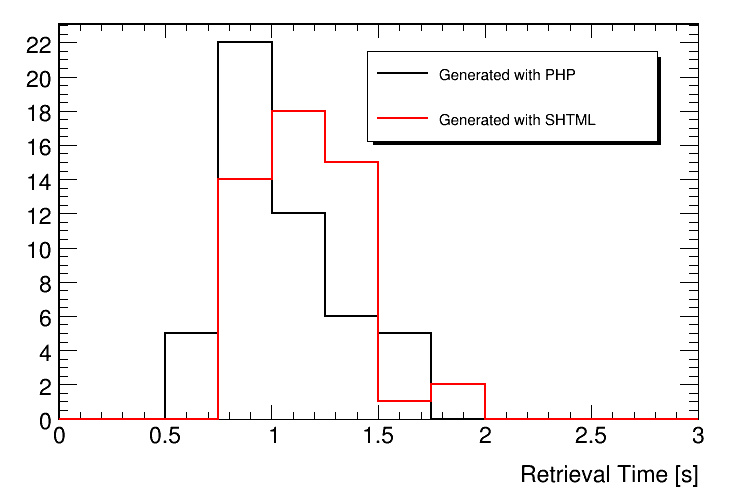 The above plot shows the retrieval time for two identical pages, one using SHTML to include a PHP snippet, the other using PHP natively. You can see that the SHTML page is slower on average (by about 12% actually), but that the spread easily covers this difference.